DEP presented their final report and recommendation (no change) to the EQB on March 18th. Delaware Riverkeeper Network, Perkiomen Trout Unlimited and Lower Milford presented testimony and photos of the Upper Perkiomen region in support of the petition. The DEP's recommendation of no change in the designation of the Upper Perkiomen was approved by the EQB after a long discussion with much questions and answers from the petitioners, the DEP, and the Board. The petition is now closed. However, the extensive advocacy (by co-petitioners, local municipalities, member organizations of the Campaign for Clean Water, and other allies) at the EQB level met with some success and was evidenced in the close questioning of DEP during the meeting. The petitioners also garnered strong support and letters from legislators including Sen Bob Mensch, Rep Greg Vitali (who sits on the EQB), Senator Pat Brown, Rep Kessler, Rep Simmons, and Rep Toepel. (Senator Wonderling - no longer in office also supported the petition). Importantly, an unprecedented waiver of the two year wait time to submit new data and or a revised new petition was granted. In addition the petitioners were successful in urging the Fish and Boat Commission to perform trout surveys in the coming months to determine if sections of the upgrade area are deserving of Class A designation. 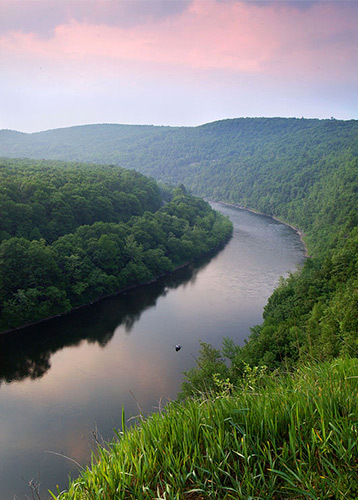 On March 18, 2014, co-petitioners including Delaware Riverkeeper Network, Perkiomen Trout Unlimited, and Lower Milford Township presented to the PA Environmental Quality Board in support of the Upper Perkiomen stream upgrade redesignation petition that was submitted in 2008. They highlighted community support for the petition and qualifiers they believe make the Upper Perkiomen deserving of Exceptional Value designation. They also included photos of the region as they presented before the EQB which are part of this presentation. On February 11, 2013, DRN received notice from DEP that the Department finalized their draft report on the Upper Perkiomen redesignation petition and was denying all upgrades to all segments of the Upper Perkiomen. DEP planned to present their final report to the EQB for the Upper Perkiomen petition at the Feb 18th EQB meeting. DRN and co-petitioners submitted extensive comments in November last year urging DEP to consider more data and information submitted before killing the Upper Perkiomen upgrade petition. Despite comments from DRN and co-petitioners, Lower Milford Township, letters from Rep Simmons and Senator Mensch and over 80 letters in support of the petition submitted, DEP finalized their draft report (below) which denied any upgrades to the Upper Perkiomen - leaving all designations as status quo. And DEP gave DRN only seven days notice that they were presenting their report to the Environmental Quality Board at the Feb 18th, 2013 meeting in Harrisburg to move the petition one step closer to failure. But the Upper Perkiomen got a last minute reprieve on Feb 17th after requests from Rep. Greg Vitali (who sits on the EQB) DRN, Trout Unlimited, and other co-petitioners requested DEP Secretary Chris Abruzzo and Chair to the EQB remove the Upper Perkiomen from the EQB agenda on Feb 18th. Hearing us, Secretary Abbruzzo contacted DRN on the Presidents Day Holiday and tabled the Upper Perkiomen agenda item for the time being. But the next time the EQB could take the petition up could be as soon as March 18th at the next regularly scheduled EQB Meeting so continued pressure to reverse this decision is needed and continuing by DRN and others who want to see the Upper Perkiomen upgraded to Exceptional Value. We are urging the EQB to give us more time to collect additional data and information and to urge the EQB that if DEP brings the petition to the Board, EQB members request DEP hold off on finalizing the petition and encourage more data collection and review and consideration of co-petitioner information that was submitted. Perkiomen Creek Current.jpgDiagram shows the current segmented designated uses for the Upper Perkiomen Basin. Green Lane Reservoir is a major drinking water source for the surrounding region. Stream data collected by Delaware Riverkeeper Network and Stroud Water Research Center indicate that the Upper Perkiomen Watershed located in parts of Montgomery, Lehigh, Berks and Bucks Counties is deserving of higher protections. In light of the exceptional quality of the Upper Perkiomen Watershed and the national and regional significance of this watershed, in December 2007, Delaware Riverkeeper Network and its partners submitted a 43-page petition along with stream data and Appendices to the PA DEP to request an upgrade of the Upper Perkiomen Watershed to Exceptional Value and the Macoby Creek to High Quality. This regional upgrade, if granted by PA DEP, would better protect the quality of these streams which flow into Green Lane Reservoir and provide drinking water to many Montgomery County residents. The Exceptional Value designation would more accurately reflect the current importance and quality of the Upper Perkiomen Basin. In February, 2008, Delaware Riverkeeper Network, Perkiomen Watershed Conservancy, and Perkiomen Valley Trout Unlimited presented new findings in support of the Upper Perkiomen Creek before the Environmental Quality Board (EQB) in Harrisburg and provided additional co-petitioners and supporters of the upgrade petition. At this meeting, PA DEP recommended the petition be considered and the EQB voted unanimously to accept the petition for consideration. Stream surveys by PA DEP will be the next phase of this upgrade process. Since that time, several supplemental packages have been provided to PA DEP to support the petition. On Sept 18, 2013, PA DEP provided public notice that the PA DEP draft report for the petition was out for a 30-day public comment. Unfortunately , PA DEP is recommending that the Upper Perkiomen NOT receive EV designation and instead remain at its current designated uses for all reaches of the Upper Perkiomen (see maps below for proposed upgrade and current designations). Delaware Riverkeeper Network and its co-petitioners are urging DEP to reconsider their decision and provide a longer comment period for the petitioners to reply and respond. With public input for a longer extension, PA DEP extended the public comment period to November 18, 2013 - giving 60 days notice. DRN and our co-petitioners are still urging PA DEP to give us more time and extend the comment so more data gathering can occur. Diagram shows the exceptional value designation that DRN and co-petitioners requested for the Upper Perkiomen (in green) (and High Quality designation for Macoby Creek - in dark blue).